Kevin Savigar in his Satinwood Studio. Musically, Rod Stewart’s latest album harks back to ’70s folk-rock, but its writing and production were totally 21st Century. In a career spanning more than half a century, 28 studio albums and well over 100 million record sales, Rod Stewart had worked almost everywhere, from cheap, grotty recording studios to opulent big-budget facilities. Yet his 29th album was the first to be recorded in true 21st Century cottage-industry fashion: at his own home, on an ultra-low budget, with just one man engineering, mixing and co-producing. Despite its humble origins, the resulting album, Another Country, reached number two in the UK, and unlike so many of today’s albums, which disappear without trace after a week on the charts, Stewart’s effort was still flying high in many hit parades several weeks after its release. Unusually, Stewart had a hand in writing all but two of the album’s 12 songs, continuing a direction that began with the album’s 2013 predecessor Time — his first UK chart-topper since 1976’s A Night On The Town. The last album by Stewart on which he had co-written the majority of songs was Out Of Order, released as far back as 1988, and his songwriting career appeared to have ended with the handful of originals on Vagabond Heart (1991). In his 2012 book Rod: The Autobiography, the singer put his songwriting drought down to a withering comment made by an A&R executive sometime in the early ’90s, which triggered a massive loss of confidence. The album’s engineer, mixer and co-producer, and also Stewart’s co-writer on most songs, is Kevin Savigar. Like Stewart, Savigar is a former Londoner who moved to California in search of more sunshine and career opportunities. He studied classical piano at Trinity College Of Music in London, and has worked off and on with Stewart since joining the singer’s live band in 1978. The first songs he co-wrote with Stewart appeared on the singer’s Foolish Behaviour (1980). Over the years the two went on to co-write a number of classic Stewart songs, amongst them ‘Forever Young’, ‘Every Beat Of My Heart’, ‘Passion’, Can’t Stop Me Now’, ‘Tonight I’m Yours’ and ‘Lady Luck’, and Savigar and Stewart co-produced the singer’s 18th solo album, When We Were The New Boys (1998). Over the years, Savigar has also played, written and/or produced for the likes of Bob Dylan, George Harrison, Pat Benatar, Peter Frampton, and many others. “Although we had not seen each other for a while we quickly began talking about writing some new songs together,” explains Savigar. “Rod was in the middle of recording a blues record with his touring band in a small studio in the San Fernando Valley called City Sound. So I came into the project halfway, and we co-wrote six more songs and finished the album together, with us co-producing. During this time we also recorded one track for his  Christmas album, Merry Christmas, Baby, ‘Auld Lang Syne’, all done in the box and recorded at his house, and he saw how well that came out. It opened his eyes to how painless it is to record like that. 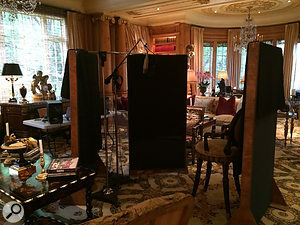 For recording Rod Stewart’s vocals, Kevin Savigar set up an impromptu booth using acoustic screens, with his own laptop rig positioned to facilitate communication between the pair. This shot was taken at Stewart’s English home, Wood House.“Over his career, Rod has spent a lot of money and a lot of time in recording studios and it stopped being a pleasurable experience for him quite a few years ago, as it involved sitting in a place without daylight, watching the clock and spending hours away from his family. So we decided that recording at his house was the way forward for us. It’s easy to make it fit in with his hectic schedule, and it’s far more relaxed. It enables him to have the kids around, and between sessions he can take care of his business, and we can watch the football. At this point the title of Rod Stewart’s 1984 hit song ‘Some Guys Have All The Luck’ comes to mind, but Savigar explained that while, admittedly, no blood or tears were shed during the making of Another Country, it did involve some sweat, and a lot of hard work, mostly editing and mixing. The latter was conducted by him at his Satinwood Studio, while Stewart was busy doing other things, like the tough job of taking in the adoration of hundreds of thousands of fans as he was touring the planet. As Savigar explains, the writing and recording processes for Another County were as modern as it gets, leading Stewart to state in a recent interview that it “revolutionised” the way he thinks about songwriting and recording. “I think the entire writing and recording process is far more streamlined for him now,” comments Savigar. “The way we did things opened doors in being able to write at a pace that’s comfortable for him, and to say what he wants to say in his lyrics. After he’d written his autobiography he found that there were many aspects of his life that he could incorporate in his songs. The book came together at the same time as he reconnected with me. The comment by the A&R manager in the ’90s had been a devastating blow for him, which was totally uncalled for, as I think that Rod is a fantastic songwriter, and luckily he got back to it in a big way. It’s quite remarkable for someone at this stage in their career to be this prolific, co-writing 10 originals on Time and 14 on Another Country. That’s a lot of new songs within three years! Savigar and Stewart began writing songs for Another Country in October 2013, with recordings at his house starting in January 2014 and the final mix taking place during March 2015. “There was a lot of down time, because in that time frame he did a European tour, a US tour, a South American tour and an Australian tour,” recalls Savigar. “At times I would go out to meet Rod while he was on tour, for writing and vocal recording sessions. 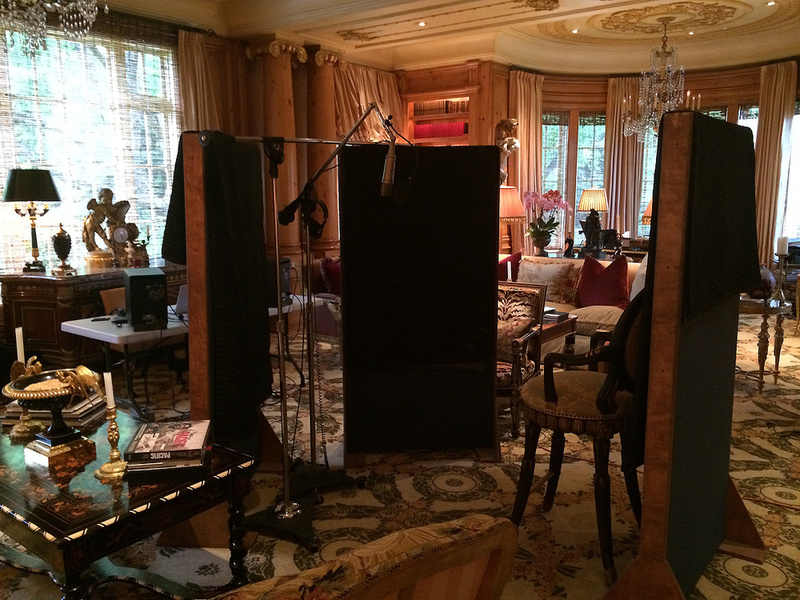 For some of the vocal sessions we set up at his home near London, Wood House. We recorded the rest — drums, bass, guitars, brass, backing vocals, choir and most of his lead vocals — at his house in LA, Celtic House. Players came and went to overdub their parts as we needed them. For the Another Country sessions, Savigar’s recording approach was positively Spartan. “We just rented some baffles and set up a mic and a laptop and the Apollo Twin and cut the vocals. It was great! I needed something portable, because Rod moved around a lot because of his touring schedule, so I’d be hopping on a plane at times with just my laptop, the Apollo and a couple of mics. It was also great to have everything in the box, because it meant that I could always pick up where we or I had left off. 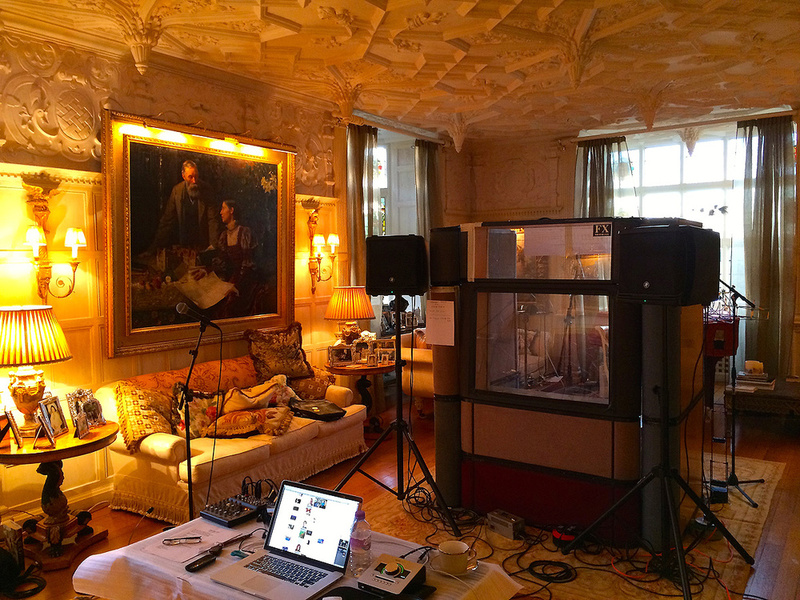 The setup used to record vocals at Rod Stewart’s home in LA, Celtic House. “When we were at his house in LA I had a Neumann U67 for Rod, which I rent from LAFX. It’s an old vintage mic, which is in great shape, and which has been used on Rod’s voice for years. I also rented acoustic panels from LAFX, to control the room, which was a little live. They help to deaden the sound and also to give Rod a physical space to sing in. We kept the panels a little apart in front of him, because he likes to see me, which allows me to cue him in and give him feedback and things like that. I sat facing him, with a low table on which I have my laptop and the UAD Apollo Twin mic pre. Rod sings with Sony MDR-7506 headphones on. He likes them as they are crystal-clear and punchy. “When we were in London I could not get a 67, so I used a U47 instead, which worked out great as well. His vocal mic goes straight into the Apollo Twin, and I used the UAD 610B tube preamp and EQ plug-in on him, which sounds nice, and some UAD 1176 with a very low threshold and not much compression at all, and UAD Helios 96 EQ to brighten his vocal sound up a bit. That was my entire input chain. Rod has a very loud voice, but also sings some passages very softly, so there’s quite a dynamic range in his vocal, and I needed the 1176 to keep that under control. The instrumental parts were captured with equal efficiency. “Most of the drums on the album were programmed, often based on live loops from Drums On Demand and with a lot of triggering from [XLN Audio’s] Addictive Drums. I did record some live drums at Rod’s library, played by Iggy Grimshaw, who set up a small kit that I recorded with just two mics, an AKG D112 on the bass drum and a U47 as overhead, both of which went through the Apollo Twin. So the drums were in mono, and I then later at my studio triggered other sounds from that. The idea was to capture the live feel, and then adjust the sound later, and that worked great. Rod’s live band bassist, Conrad Korsch, came over for a week when they were performing in Vegas, and I just plugged him DI into my Apollo Twin, and had some UAD 1176 on him. For most songs he just played two takes. It was really quick. “There was a lot of violin on the album, played by J’Anna Jacoby, who also is in Rod’s live band. She came in and jammed and just played wonderful parts and lots of solos. I recorded her with an AKG C414 and a little UAD compression and EQ and that was it. All mics I used on the album went through the Apollo Twin! I recorded the three horn players together and separately, and I think I used 414s on the horns and a 47 on the saxophone. We also had a choir come in, which I recorded with two 67s. I spread them out in men and women so I had a little control in the mix with panning. “Most of the guitars on the album were played by Emerson Swinford, although some guitars remain from a session in Nashville, played by Mike Severs seven years ago, when I demoed a track that ended up being a song called ‘Can We Stay Home Tonight’. I played it to Rod one day, and he liked it, so he wrote lyrics and a melody to it, and we kept some of the recordings from the original session. We had to transpose everything up a couple of steps with [Celemony’s] Melodyne, because it was slightly too low for Rod. We recorded many of Emerson’s guitars at Rod’s place, using a Shure SM57 on a small amp with a blanket over it. We did all the electric guitars on ‘Please’ like that. Rod has great guitar ideas, so it’s great having him in the room for that. Marcus Nand played a flamenco guitar solo in ‘Walking In The Sunshine’ that we recorded with Rod’s 67 vocal mic, while Emerson’s acoustic guitars were recorded with AKG P170s. “Emerson lives only a couple of miles from my studio, so he would also regularly come over to my place to overdub more guitars. He is really good at arranging guitars. We worked on getting the right sounds and the right parts, and I used the same mics on him as I used at Rod’s place. I have a very small collection of mics! So I had the SM57 on electrics, and the P170 on his acoustic, though sometimes it was the 414. He also played banjo and ukulele, which also were recorded with the 414. I recorded my acoustic piano parts with a pair of P170s, though for the majority of piano sounds on the record I used samples from Production Voices’ Production Grand. I love that plug-in! Savigar applied a fair amount of trickery during the mixing stage for Another Country, though he stresses that, like everyone who works in the box, he mixes as he goes along. “Basically, we get to a stage where Rod and I are happy with the rough mix. We have all the overdubs in place, as well as the EQ and the balance, and the track is doing what it wants to do. By this stage I will print all my MIDI stuff to audio, because sometimes there’s some delay with MIDI, and audio locks a little tighter. Then, once I have Rod’s final lead vocal in, I will flatten everything, and will start over. I’ll go through each track and make sure that I have every element the way I want it. I’ll work on the balance again, and switch on the automation once that’s right. I apply quite a bit of volume automation to sections and individual parts in places where I want to emphasise or de-emphasise them, because I like the song to breathe as it goes from beginning to end. Slim Shaded The full Logic project for ‘Love Is’. At 51 tracks, the session of ‘Love Is’ is fairly compact by modern standards. 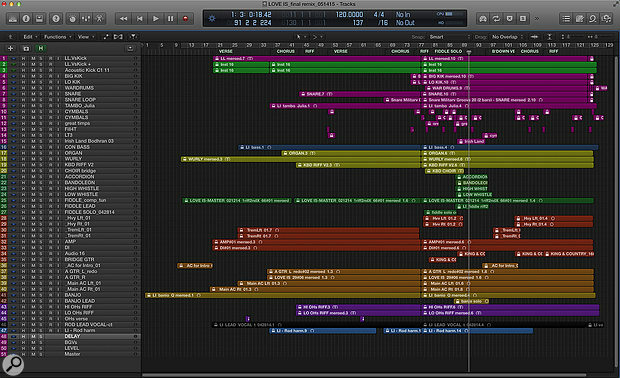 From top to bottom it consists of drums and percussion (tracks 1-15, in purple and green), one bass track (dark blue), four keyboard tracks (green-yellow), seven tracks of folk instruments like accordion, whistle and fiddle (dark green), eight tracks of electric guitars (brown), five tracks of acoustic guitar (beige), two tracks of banjo (green-beige), three tracks of backing vocals, a lead vocal track (black), and a lead vocal harmony track (light blue) also from Stewart, two effect tracks, an overall level track and a master track. “At the top of the basic verse kick sample, and below that, in green, are two kick doubles from Addictive Drums, which have a bit more spike. ‘Big Kik’ is a more ambient, four-to-the-floor kick sample in the chorus. ‘Wardrums’ come from Nexus, which has great loops. The ‘fill4T’ track has loops from Drums On Demand, from the Upbeat and Aggressive library, just throwing in some tom fills in between sections. “The bass has Chris Lord-Alge’s bass plug-in on it [ie. Waves CLA Bass]. CLA’s plug-ins feature heavily in this mix. They’re very easy to use and with just a few moves things sound good and musical. The organ is a Native Instruments Vintage Organ, which has a compressor and a limiter, just squashing it a little bit. I amped and re-recorded the Logic Wurly to give it some grit. The next two keyboard tracks double the backing vocals in the instrumental section after the choruses. 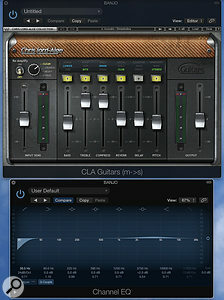 Kevin Savigar’s main mixing plug-ins for the album were the Waves CLA bundle and Logic’s own EQ. Here, the CLA Guitars plug-in is doing its thing on banjo.“There are again very few plug-ins on the folk instruments, other than a hall reverb from the Space Designer on the low whistle, while the three fiddle tracks each have CLA Unplugged, which is great. I’m using the ‘String - Canyon’ preset, which adds a lovely reverb that makes the fiddle sit nicely in the track. There’s one main fiddle that goes throughout the track, a fiddle solo and a fiddle lead immediately after the solo. They’re part of the build-up in the arrangement of the song, with all instruments finally playing during the fiddle lead section. I’m a great believer in getting the song to work musically, and if you get the arrangement right, it makes the mix a lot easier. “There are a lot of guitars in this track, even though it does not sound that way. But I like having a guitar arrangement like this, because I can work with panning to place them in several positions in the track. 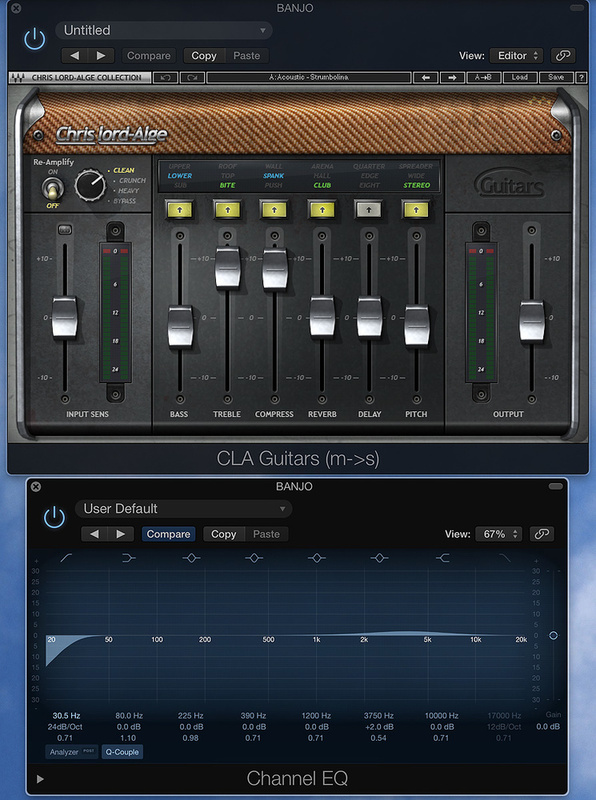 The CLA Guitars plug-in is the main treatment I used on the guitars, often treating guitar pairs slightly differently in the left and right channels. The heavy electrics have the ‘Electric - Teeth’ preset, the tremolo electrics the ‘Electric - Cleartone’ preset, and the main acoustic guitars as well as the banjo the ‘Acoustic - Strumbolina’ preset. In all cases I mess a bit with the settings. The compression is really easy, with just ‘wall’, ‘spank’ and ‘push’ options. In general I like the ‘spank’ setting the best. 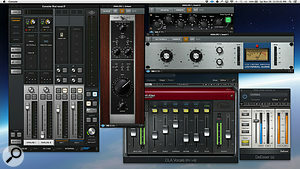 Chris’s plug-ins just sound so musical and really work. It takes just a few adjustments to make an instrument fit. 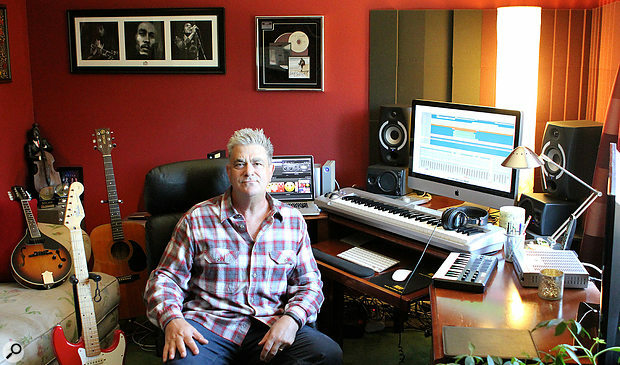 Kevin Savigar’s vocal chain for Rod Stewart began with the Universal Audio 610B Unison preamp plug-in, with brightness added by the same manufacturer’s Helios EQ, and dynamic control from the UAD 1176 emulation. Once again, the Waves CLA bundle came into effect, with a Waves De-Esser providing the final touches.“I did very little to Rod’s lead vocals during the mix. I just had the CLA Vocals plug-in on him, with a bit of ‘spank’ compression and some reverb, and a Waves De-Esser, and that was it. I used the same plug-ins on his harmony vocal, where he sings a third above his lead vocal. I think it’s the first time he has ever done a harmony vocal with himself. It’s a great sound. The backing vocals also have the CLA Vocals plug-in, on the ‘Start Me Up’ preset, plus the Tape Delay on the ‘ohs’, and they’re all sent to an effect track with the Logic Stereo Delay and Space Designer. The latter had a ‘Vocal Delay’ preset, which adds some air and room to the backing vocals. Kevin Savigar is a complete convert to the in-the-box cause, and his Satinwood Studios is the epitome of uncluttered simplicity. 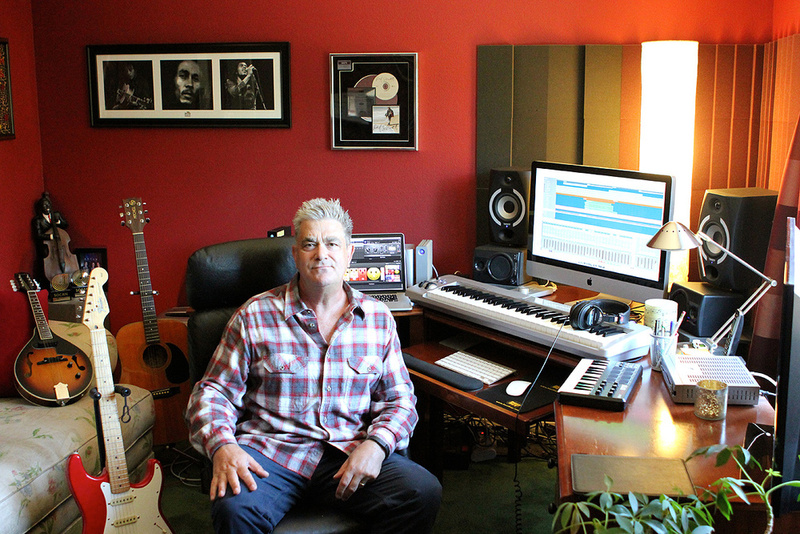 “I’ve had my own studio for many years, and have used all kinds of different formats, including 16-track reel-to-reel tape recorders and Alesis ADAT. But as soon as computer recording came about, I launched into that. For me, the convenience of the workspace has always been what makes the difference. I like analogue, and I still have a Tascam two-track that I sometimes send my audio to, and I then import it again in Logic. That’s fun and fattens things up a bit. In the early days it was a trade-off between convenience and sonic quality, but I think the playing field is more level now in terms of the sonics. “I worked on Digital Performer for a long time, but switched over to Logic five or six years ago, and that changed everything for me, because Logic is such a great program. I have version X and I love it. I had to get used to it, and I wish I could change the background colour, but I love the seamlessness between MIDI and audio and video, and I’m extremely fast with it. The recall also is a big thing for me, especially when you are doing songwriting demos and are regularly changing lyrics and arrangements. Working on tape always was a real pain in this respect. 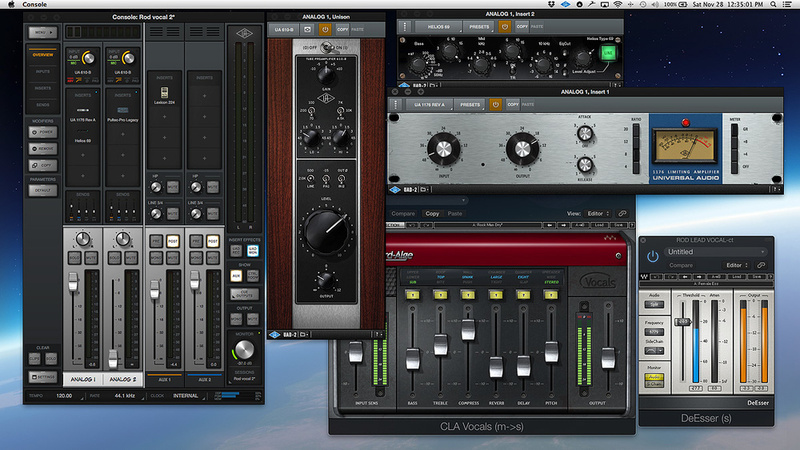 Also, the plug-ins that are available now are so great, I don’t need outboard any more. And there’s the convenience of being able to travel with a laptop, which is wonderful. “In addition to my laptop, the gear in my studio consists of the Apollo Twin, an M-Audio 61es controller, and a little two-octave Akai MPK Mini, which is great for sticking in your computer bag. My monitors are the Tannoy 601As, which sound clean and true to me, and the Haffler TRM6s, which I really like. I go to and fro between these two sets of monitors, and listen to my laptop speakers if I want to make sure that the vocal level is right. 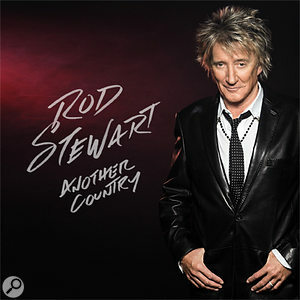 Another Country leans more heavily than most of Rod Stewart’s albums on acoustic instruments, and some of the material has strong Scottish folk influences. One response to this, in the Guardian newspaper, made Savigar laugh out loud. “Rod was criticised for jumping on the bandwagon of Mumford & Sons, which was funny, because Rod has been doing mandolins and fiddles and banjos probably even from the days before the writer was born! 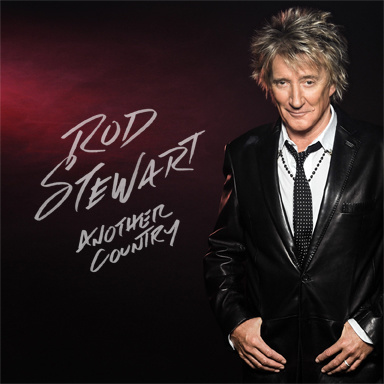 But yes, the album does sound very Scottish in places, with Rod’s pentatonic melody for ‘Another Country’ sounding almost like a traditional Scottish tune. We didn’t start out to write a record like that, but sometimes the songs just go in that direction and you just go with it. Rod has strong Celtic roots [his father was Scottish], and I enjoy that kind of music as well, so it was natural for us to go in that direction.